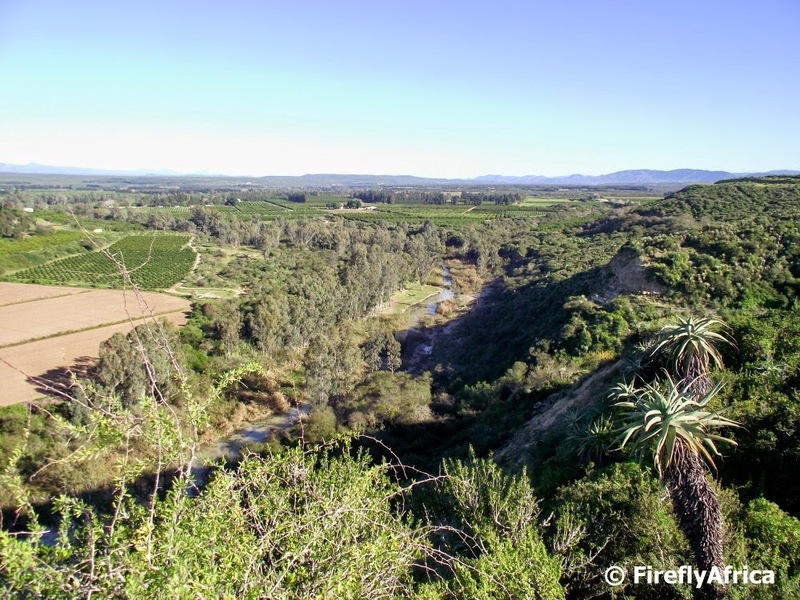 The Tsitsikamma's three biggest industries are tourism, dairy and forestry. So by the last one you can gather that the area is more than just indigenous forests. 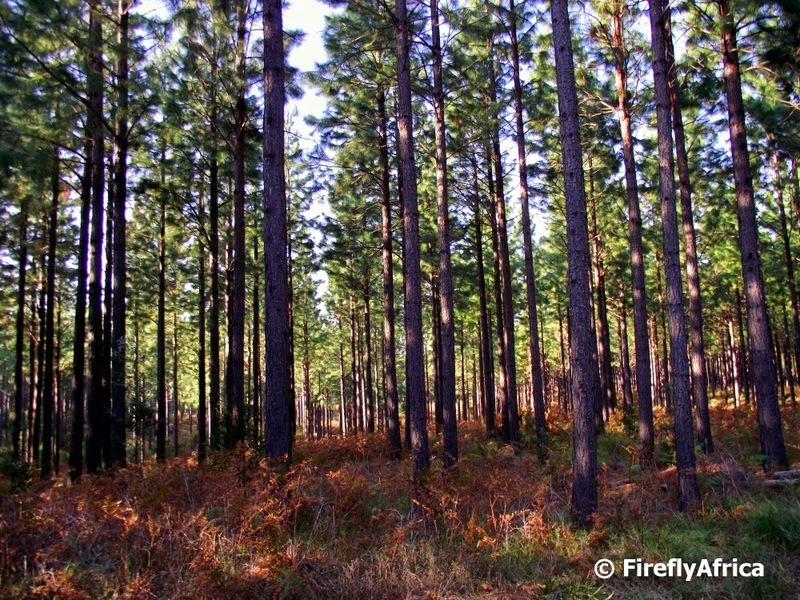 The Tsitsikamma also has a huge amount of commercial pine plantations. Pine trees were first planted early in the 20th century to replace indigenous forests that were cut out due to extensive logging. The exotic trees were a bad replacement for the indigenous trees but the fact that they grow quickly meant that they could be grown on a commercial scale keeping up with the demand for wood and wood products. They also make for great photos. Is it a bird? Is it a plane? No, its Firefly and the Famdamily. Well, that is what you would have said if you were on a walk in the Tsitsikamma forest the other day. 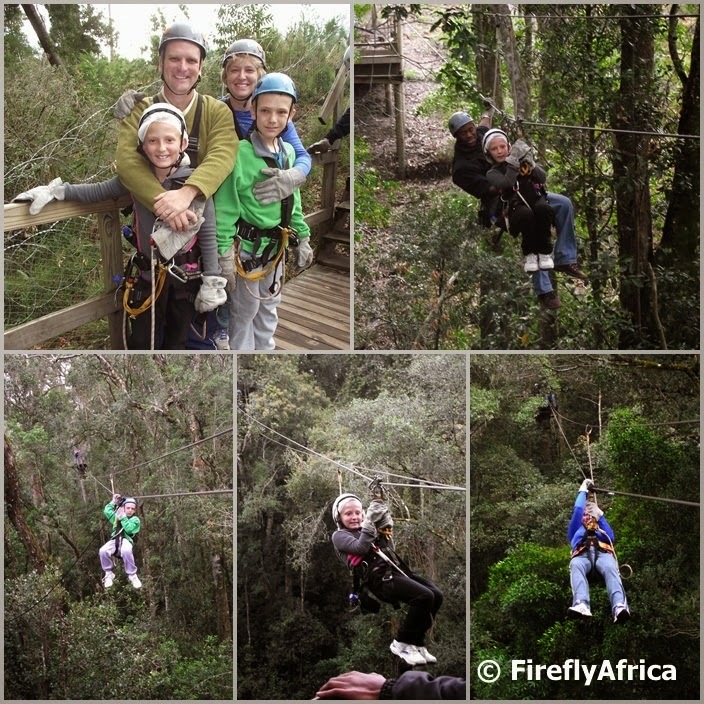 I'm in the very fortunate position that I have had the wonderful privilege to go on the Tsitsikamma Canopy Tour in Storms River a couple of times before, but I've always wanted to take the family for them to experience it as well. I'm not much of an asker (or demander like some people I have encountered over the years) but a passing mention in a random conversation led to an invitation from Anneline of Storms River Adventures for us to come and have this wonderful experience while on our Tsitsikamma Sho't Left weekend in Eersterivier. I'm not sure who was more excited, the Damselfly or the KidZ. I know the guys at Storms River Adventures deal with children every day, but I was still slightly nervous about Drama Princess as she can be a bit of a, well, drama princess. While Chaos Boy and his mom was all eager beaver, you could see Drama Princess wasn't totally convinced and asked lots of questions before the trip. At arrival I had her ready to go and kitting up went well. The guides explained everything and a thorough safety briefing was done. We were joined on our tour by three other South Africans which meant that I was hoping for no hiccups. At the first platform when the leading guide asked who was going first, Chaos Boy jumped at the opportunity. He had absolutely no nerves and from the first slide already looked like a seasoned zipliner. The Damselfly was up next and gave a little yell as she pushed off on her first slide. Not a scared yell but more of a mixture of excitement and nerves. When Drama Princess' turn came she was hooked on and then pulled the hand brake. Oh no! I really want her to have the experience but the going alone thing got to her. No worries, the guide was on it. He unhooked her and let the rest of us go before hooking her back onto the cable as well as onto him. All she had to do was hang there and he did the rest. Problem solved. Even though, like I mentioned, I've been before, the Tsitsikamma Canopy Tour will never get old for me. Its a fantastic experience and like with game drives and other tours no two are alike because of the people on the trip and how they experience it. The Canopy Tour has ten slides and, as you must have gathered, there are two guides with you at all times. The first guide is the safety guide who goes first every time to operate the braking system for those who don't stop in time themselves. The following guide tells the group more about the forest and what you see along the way. They name the trees and point out interesting things like the baboons foraging on the forest floor below us and the three Knysna Loeries hopping around in the trees about halfway through our trip. I even had two of them sweep past me as I started out on one of the slides. What an experience! 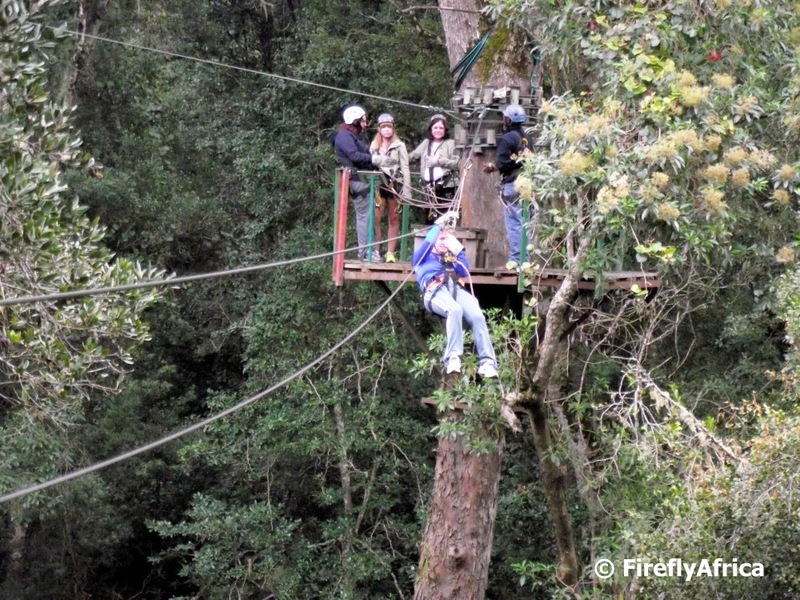 The Tsitsikamma Canopy Tour is one of those must do activities if you are travelling on the Garden Route. Anybody can do it (that Drama Princess proved to us) and its a great way to see the forest from a different perspective and the kind of activity everybody should do at least once in their lives. A big thank you for making this a truly memorable Sho't Left with the Famdamily. 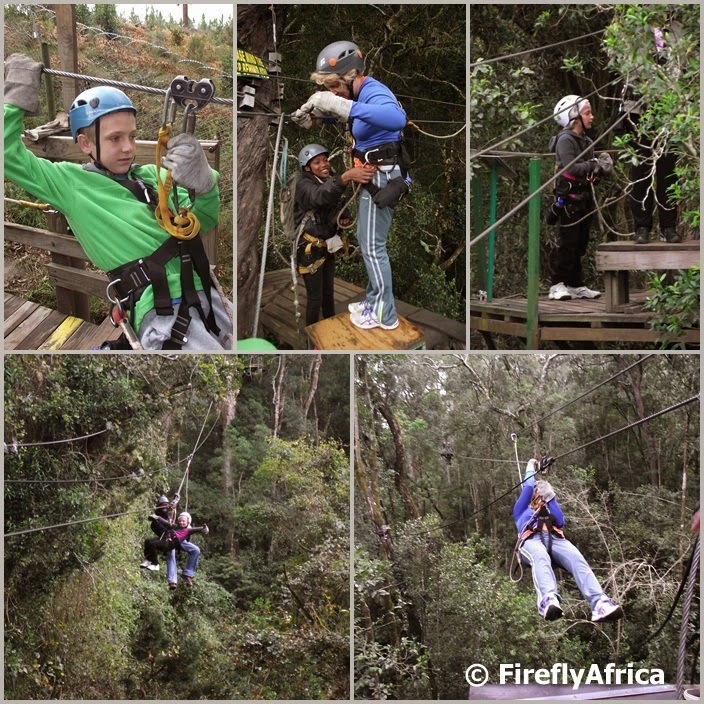 Disclosure: We went on the Tsitsikamma Canopy Tour as guests of Storms River Adventures. 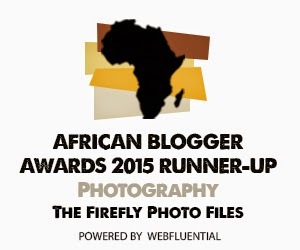 I received no further remuneration and keep full editorial control over the post. The Tsitsikamma is more than just indigenous forests, rugged coastlines and adrenalin filled adventure activities. I'm going to lie if I say I didn't know it, but its always great to spread the word. Our Sho't Left in the Tsitsikamma and Eersterivier area included a visit to Regyne, the biggest commercial protea farm in the world. 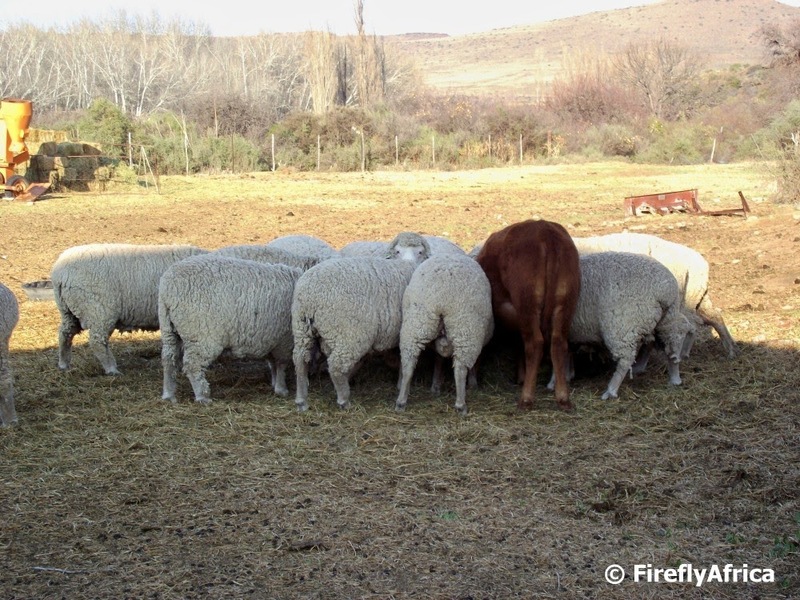 Tours of the farm is organised by Oudebosch Farm Stall who does a tour and lunch as well as a tour and afternoon tea and cake option for groups. Joining us on the tour were fellow travel bloggers Dawn Jorgensen of The Incidental Tourist, Di Brown of The Roaming Giraffe and Linda Markovina of Moving Sushi. 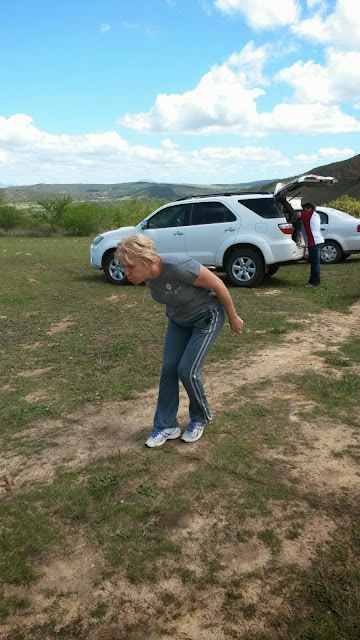 We were met by Hanli Viljoen who took us on a tour of the farm and its facilities. Regyne's protea fields cover 80 hectares and they produce flowers primarily for the export market. Proteas are cut, sorted and trucked straight to the airport for export. Hanli started off by showing us their sorting shed and cold room. Because it was weekend there were no staff on site, but she explained the process they followed. Most of the proteas were shipped out the day before but there were still an impressive variety of flowers in the cold room for us to see. From here we moved onto the protea nursery where Hanli spends most of her day. It was unbelievable that the proteas are actually grown from seed and how the seedlings are handled before going into a field. We also visited one of the fields where they grow King Proteas, South Africa's national flower. Seeing them grow like that makes me want some in my own garden. I didn't think the KidZ would be very interested in the farm, but they actually paid very close attention and I think enjoyed it and learned as much as we did. Disclosure: We visited Regyne Protea Farm as guests of Oudebosch Farm Stall. I received no further remuneration, wasn't asked to write a positive post and keep full editorial control. Sir Percy FitzPatrick, (24 July 1862 – 24 January 1931) is probably best known for writing the book Jock of the Bushveld, but also played a big role in the early development of the Sundays River Valley. In his younger years he was involved in gold and diamond prospecting in Mpumalanga where Jock of the Bushveld also plays off. In 1895 FitzPatrick became the secretary of the Reform Committee in Johannesburg which conspired to overthrow Paul Kruger's South African Republic. At the outbreak of the Anglo-Boer War (1899–1902) FitzPatrick helped to establish the Imperial Light Horse Regiment but was prevented from active service by ill health. He was knighted in 1902 as a Knight Commander of the Order of Saint Michael and Saint George. He served as one of eight Transvaal representatives in the national convention of 1908–9, where four British colonies were consolidated into the Union of South Africa and went on to serve as a member of the parliament of the Union of South Africa. After coming to the Sundays River Valley he established the Sundays River Settlement Company which encouraged people to settle in this area. He also played a very big role in the establishment of the citrus industry in the valley and the amazing irrigation system of this area was his brain child. His idea was to channel water from the Orange River, six hundred kilometres away from Sunland, into this arid area thus enabling agriculture to flourish here, as it does today, providing employment for the many local people. FitzPatrick bought a piece of land next to the river from where his guests could enjoy the stunning view of the surrounding valley. He even had a lookout platform built on the land where visitors can still go to marvel at the view. After his death he was buried at The Lookout where he's wife is buried alongside him. The Lookout and the surrounding land was donated as a public space my his daughter and son-in-law in 1953 and the site was declared a National Monument. 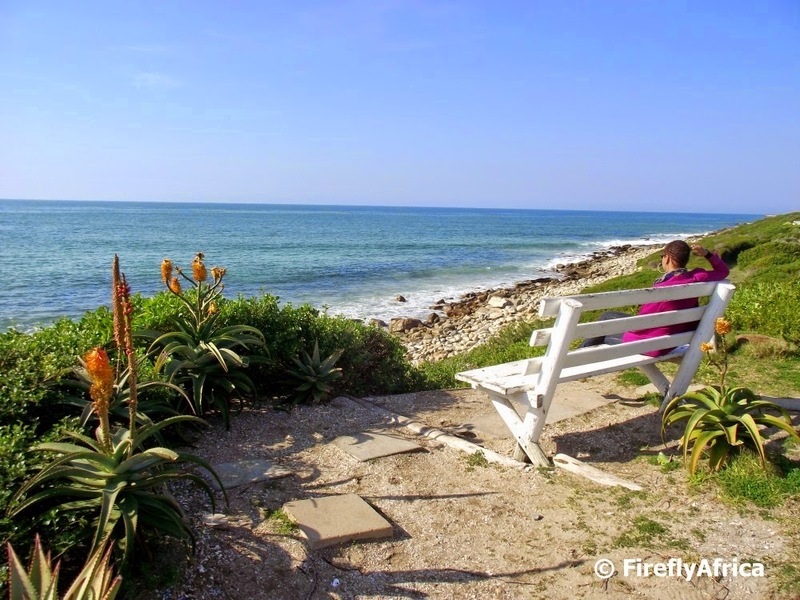 There are some really tranquil spots along the Jeffreys Bay and St Francis coastline where one can sit and take in a view of the ocean. Passing through St Francis Bay I had an hour or so before a meeting and decided to grab a couple of Geocaches. One of the caches was located close to the legendary surf spot, Bruce's Beauties where I found this young lady taking a break on a bench overlooking Bruce's. The sea was fairly calm so there weren't any surfers out there on this specific day. So how did Bruce's Beauties get its name, you ask? In the 1960's, surfing film pioneer Bruce Brown hunted the world's perfect surf spots for the cult film classic ' The Endless Summer'. He wanted to find the "Perfect Wave" and at St Francis he did. The spot became known as Bruce's Beauties and is renown as a surf spot for the fearless. This exposed point breakis seen as an ultimate wave ride. Unfortunately due to development along the coastline the break isn't what it used to be but two or three times a year the conditions are just right and then you know this is the place to be if you own a surf board. Hidden on the rugged eastern coastline of the Tsitsikamma is a little gem that not a lot of people know of. Somewhere you can get away from it all and enjoy stunning scenic coastal landscapes bordered by cliffs and lush vegetation. Somewhere you can take in a bit of beach life and lots of vitaminSea without being trampled underfoot by crowds. 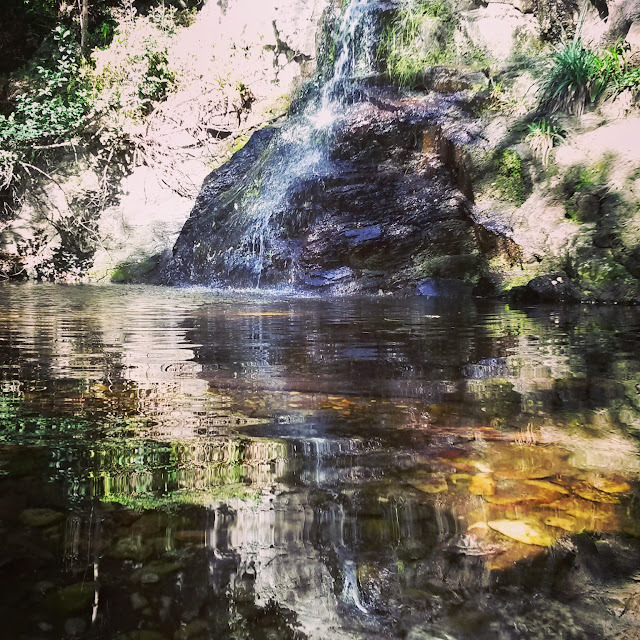 This little hidden corner on the Garden Route is Eersterivier. One can't really call Eersterivier a town or a village. Its rather a collection of privately owned (mostly) holiday homes. There aren't any hotels and I can't remember seeing any guesthouses, but it is possible to rent on of the 19 houses that Tsitsikamma Seaside Accommodation manages on behalf of the owners. A couple of weeks ago Penny of Tsitsikamma Seaside Accommodation invited us for a Sho't Left weekend and we got to stay at Shick Shack while we were there. Shick Shack was anything but a shack as it sleeps eight people in four bedrooms and has the most stunning view of the coastline (bottom middle picture). The area around Eersterivier is really beautiful but the main attraction is the beaches. Its is a rugged and rocky coastline but there are lots of little coves and gullies along with the main beach on the western side of the village. The centerpiece of the beach are fossil dunes with very interesting sand stone features. 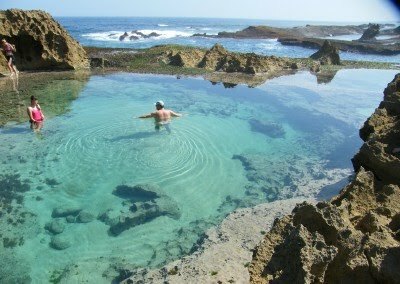 It is here that you find one of the most inviting swimming spots around, the blue hole. At low tide we took a walk around the sea side of the sand stone formations and found a couple of holes in the rock. We came back at high tide and looked down onto it from above. 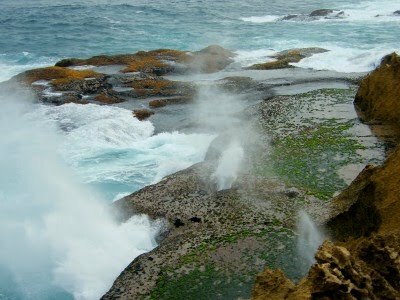 They turned out to be blow holes, shooting water up into the air from them every time a wave hits the rocks. When you explore the rock pools and around the back of the sand stone formations, just be aware and keep an eye out for spiky sea urchins, specially if you have children with you. The pools and gullies are actually excellent for snorkeling so bring your equipment with you if you would like to explore a bit under water as well. Another warning though. Keep within the safe zones when swimming and snorkeling as there are dangerous rip tides beyond the rocks and gullies. In addition to beach walks there is also a couple of short hiking trails in the area where you walk through the surrounding fynbos, some that follow the top of the coastal cliffs and look down on the whole area from above. Golfers would love the nearby 9 hole Fynbos Golf Estate with its views of the ocean and the Tsitsikamma Mountains as a background. 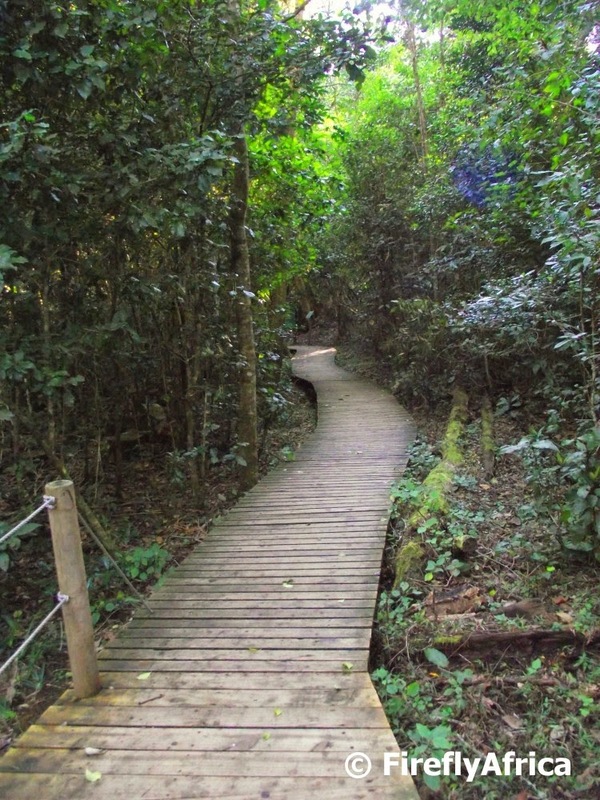 About 30 minutes away is Storms River Village with its forest walks and adrenalin filled adventure activities. Eersterivier isn't a proper village so there are no shops and atm's. Luckily the Oudebosch Farm Stall and coffee shop is only about 10 minutes away with most visitors getting what they need from the supermarket there. Its also ideal for breakfast and lunch or just a quick coffee and milkshake. The Tsitsikamma is a true Garden of Eden and if Adam and Eve lived in this garden and had the opportunity to go to the beach, Eersterivier would have been that beach. Disclosure: We enjoyed this visit as guests of Tsitsikamma Seaside Accommodation and transport was courtesy of the team at ECTOUR. I received no further remuneration, wasn't asked to write a positive post and keep full editorial control. Jeffreys Bay is famous as a surf destination and one of the reasons is Supertubes. Supertubes is said to be the best right hand point breaks in the entire world both in consistency and quality. Generally Supertubes break for about 300m or more but if conditions are right and the surf is big enough then it links up with the surrounding surf spots and result in a ride of about a kilometer in length. I'm not a surfer and have never had the opportunity to try it, but I enjoy scenic views so on my last visit to JBay I stopped by the Supertubes view site. It was a beautiful day although not one with big surf. 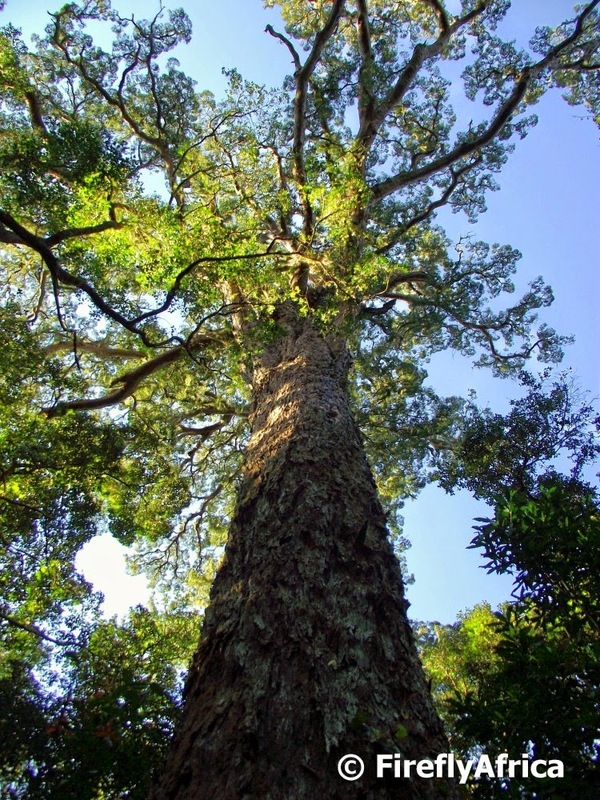 One of the best know attractions in the Tsitsikamma is The Big Tree, one of the giants of the forest and thought to be up to 1000 years old. 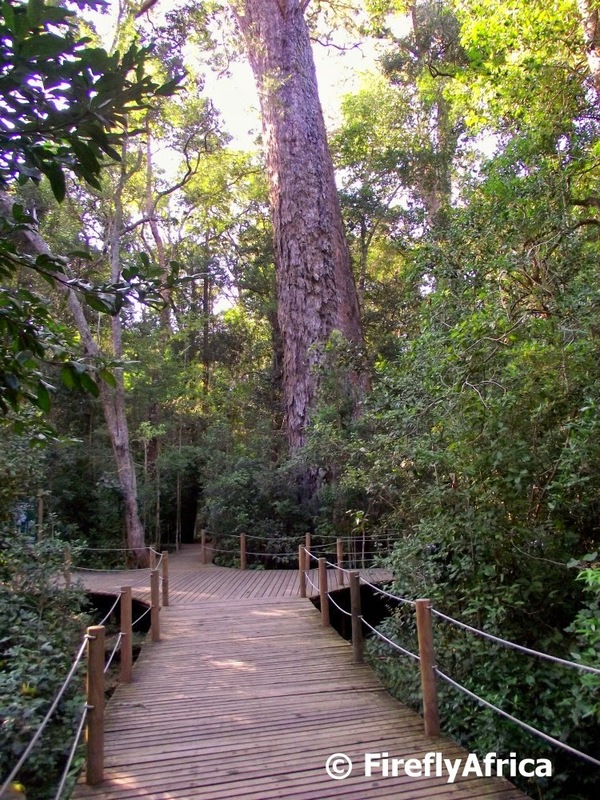 The Garden Route from the Tsitsikamma through Knysna to Wilderness is famous for its indigenous forests and precious trees, amongst them the Yellowwood. The Outeniqua Yellowwood tree is also South Africa's national tree which makes this particular Outeniqua Yellowwood even more special. Getting to the Big Tree is very easy. First of all there is a big parking area right next to the N2 highway where you can leave your car. From here its an easy 10 minute walk into the forest on a boardwalk. In total the walk is about 500 meters each way and a great way to get away from the rush of the main road and get closer to nature. Walking along you get to see what the forest looks like inside and plaques name some of the trees you pass along the way. Suddenly the queen of the forest looms up in front of and over you. A magnificent tree that was spared the woodcutters' axes during the late 19th and early 20th century. This tree stands 36,6 m tall and has a trunk circumference of 9m. An information board next to the tree gives all the relevant stats. The Big Tree may not be as tall as American Redwood trees or as wide as a Baobab, but she is magestic. I really enjoy seeing people crawl around on the path to find the best angle to try and show her size. I kinda had to do that to take this picture above. From the tree there are two additional trails covering 2,6 km and 4,2 km for those who would like to get in touch with the forest a little bit more. So next time you fly along the N2 through the Tsitsikamma, why not pull over and go and pay homage? We really don't need much motivation to pack our bags and head somewhere for a Sho't Left weekend. Not at all. Even more so when the invitation for that Sho't Left comes from the Tsitsikamma which is only an hour and a half from our home base in Port Elizabeth. 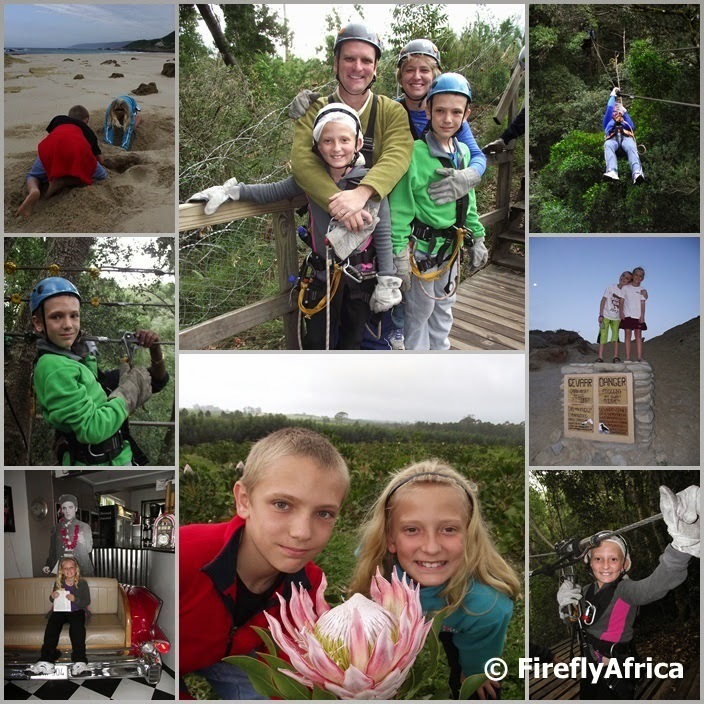 A call from Penny of Tsitsikamma Seaside Accommodation along with an earlier invitation by Anneline of Storms River Adventures had us planning a weekend that included some beach time, nature time, family time and ultimately, adrenalin time. An early departure on Friday afternoon had us driving west on the N2 from PE and taking the Oudebosch turnoff on the eastern side of the Tsitsikamma. A short time later we reached the seaside town resort village cluster of houses called Eersterivier. 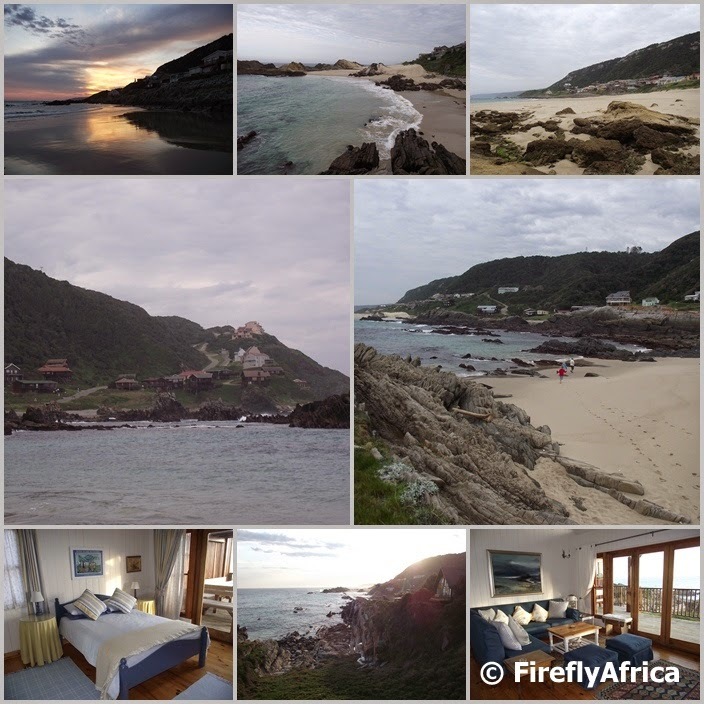 Eersterivier is just that, a collection of holiday homes along the beautiful Tsitsikamma coastline and Penny manages 19 of these which get rented out to the public when the owners aren't using them. We stayed in Shick Shack which was anything but just a shack. It sleeps eight in four bedrooms and has a sublime view of the coastline from its deck . Perfect to sit and relax on after a hard day of Tsitsikamma'ing. Saturday morning we spent a bit of "beach time" exploring the Eersterivier beach with its fascinating fossil dunes and sandstone formations. The two most notable features for me were the blue hole, perfect for swimming, and the blow hole which gets spectacular at high tide. 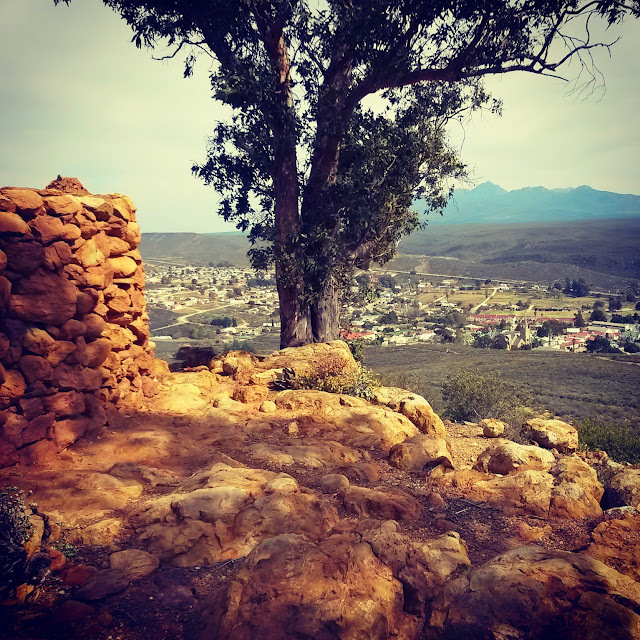 We decided to head inland for a little while and went to explore the town of Kareedouw just across the mountain before stopping at Oudebosch Farm Stall for lunch. 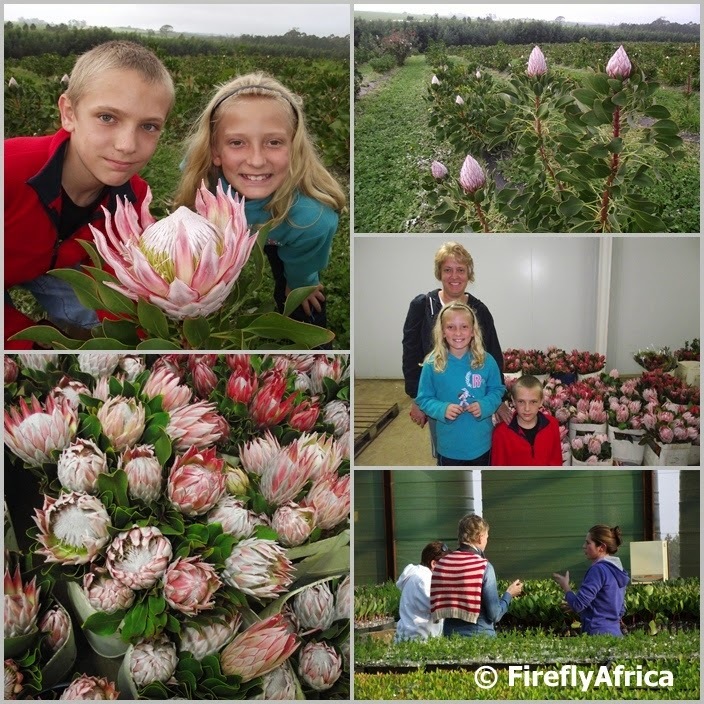 Just a few kilometers from Oudebosch is Regyne Protea Farm, the biggest commercial protea farm in the world. Oudebosch Farm Stall organizes tours of the farm for groups during the week, but we were lucky enough to join a couple of travel bloggers on a private tour that afternoon. 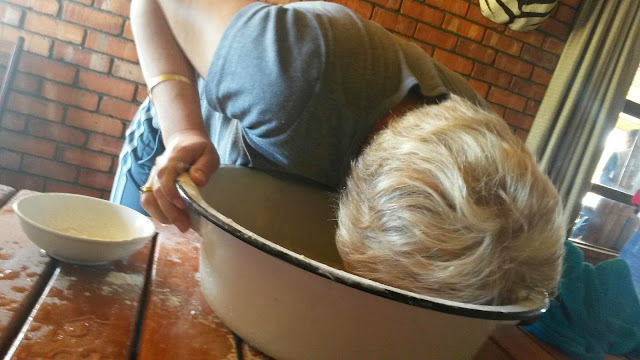 Sunday started with a bit of a sleep in before packing up and returning to Oudebosch brunch. Then it was time to head to Storms River Village for the highlight of our trip, a Tsitsikamma Canopy Tour with Storms River Adventures. And what an adventure it was. Being in the business I'm in I've had the opportunity and privilege to go on this a couple of times before, but it was a first for the rest of the Famdamily with Chaos Boy volunteering to take the lead just behind the guide. Drama Princess was slightly nervous but the second guide was on top of things and she got to do a couple of tandem slides with him until she was comfortable enough to go on her own. Sliding along the 10 slides through the canopy of the indigenous Tsitsikamma forest 30 meters up is always a highlight and something we will remember for a long time. we participated in in the coming weeks. Disclosure: We enjoyed this visit as guests of Tsitsikamma Seaside Accommodation, Oudebosch Farm Stall, Storms River Adventures, Tsitsikamma Tourism and the team at ECTOUR. I received no further remuneration, wasn't asked to write a positive post and keep full editorial control. 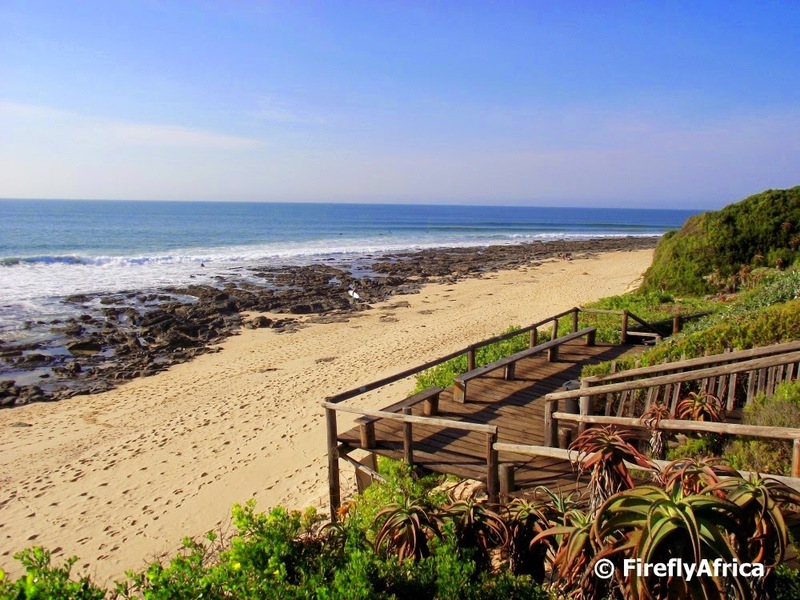 Jeffreys Bay has always been know for two things. Surfing and shells. These days surfing in the town is bigger than ever but unfortunately shells aren't. I remember when I was small we always visited my grandparents at Paradise Beach close by over school holidays. You could go out early morning just after high tide and pic up the most beautiful shells. These days there are very few left. Lots of small ones but no more big and beautiful ones although you can still get lucky every now and then. 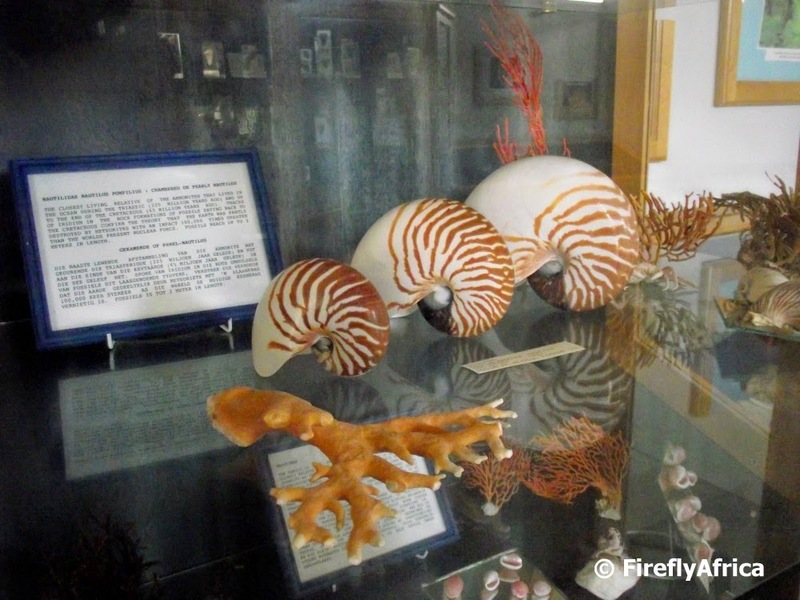 If you do want to see beautiful shells though the best bet would be to head over to the Jeffreys Bay Shell Museum. 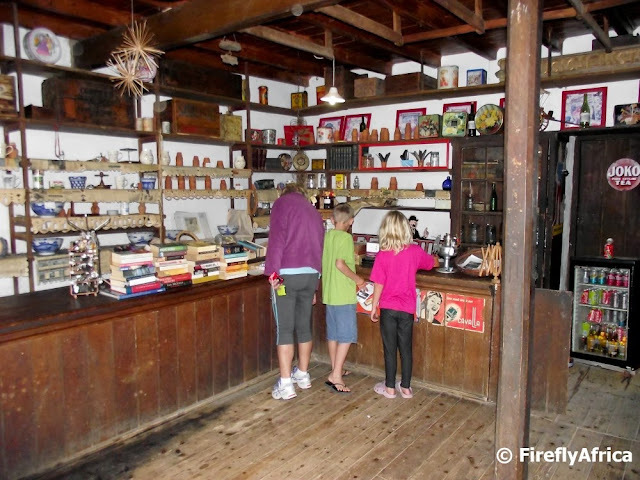 It located behind the Jeffreys Bay Tourism office just off the main drag through town and is well worth a visit. 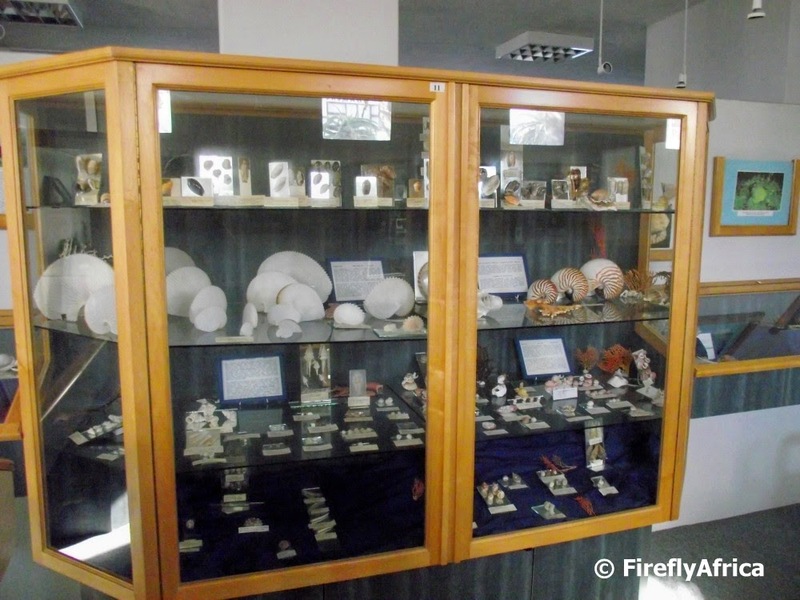 This collection was started by Charlotte Kritzinger, a local shell collecting spinster, in 1945. 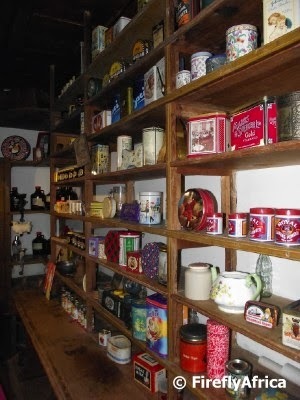 She pursued the hobby till her death in 1965 and later the whole collection was donated and the museum established. Close to the museum you will also find the Shell Booths where local shell craft can be purchased. I have never been disappointed with sunsets at Eersterivier. 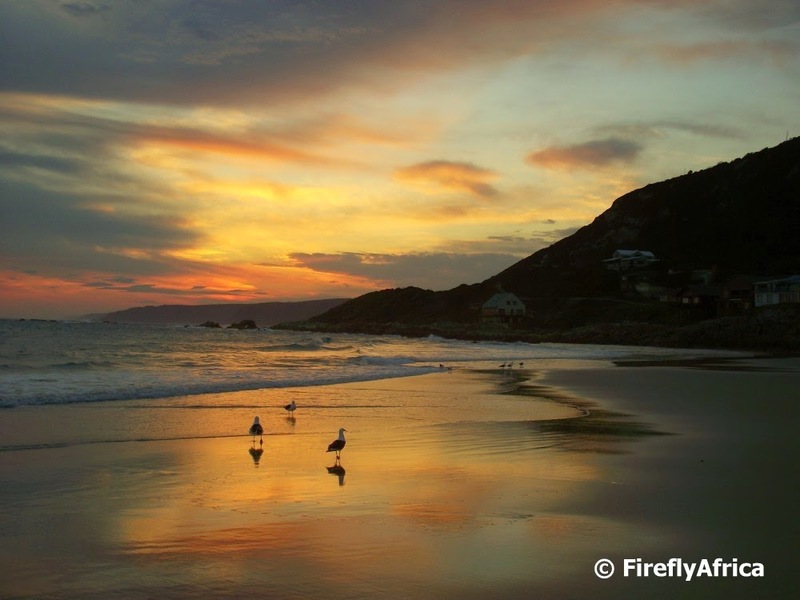 We recently spent a weekend in this part of the Tsitsikamma courtesy of Tsitsikamma Seaside Accommodation and even though most of the weekend was a bit on the grey side, the cloud did open enough on our first evening to get this beautiful sunset enhanced with a couple of gulls strolling around on the wet sand. 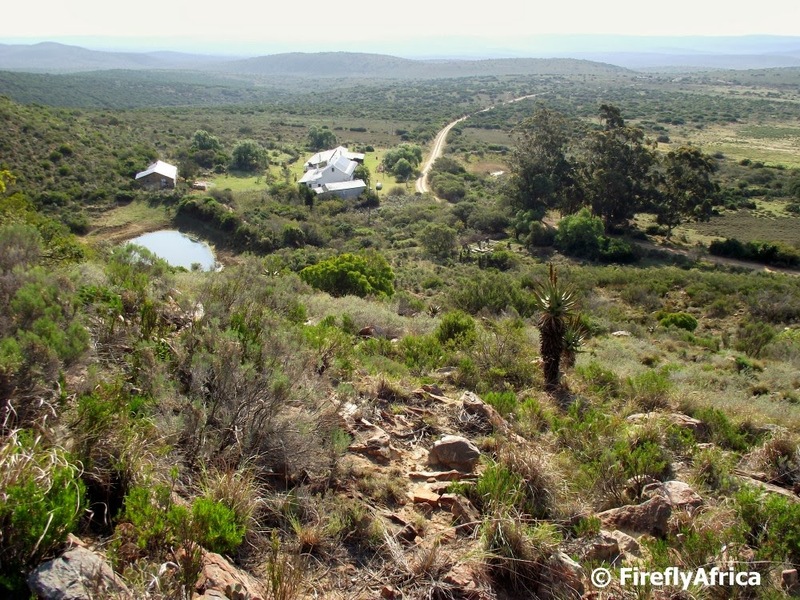 I recently spent a night at the highly recommended Ganora Guest Farm near Nieu-Bethesda. Early morning before breakfast I went for a walk around the farm and down to the river. On my way back I found this interesting scene of a calf having breakfast with the sheep. A case of mistaken identity? Uniondale between the Klein Karoo and the Langkloof is famous for it's ghost, but I'm sure most people know very little else about the town. Visitors will also find a lot of history in the area. 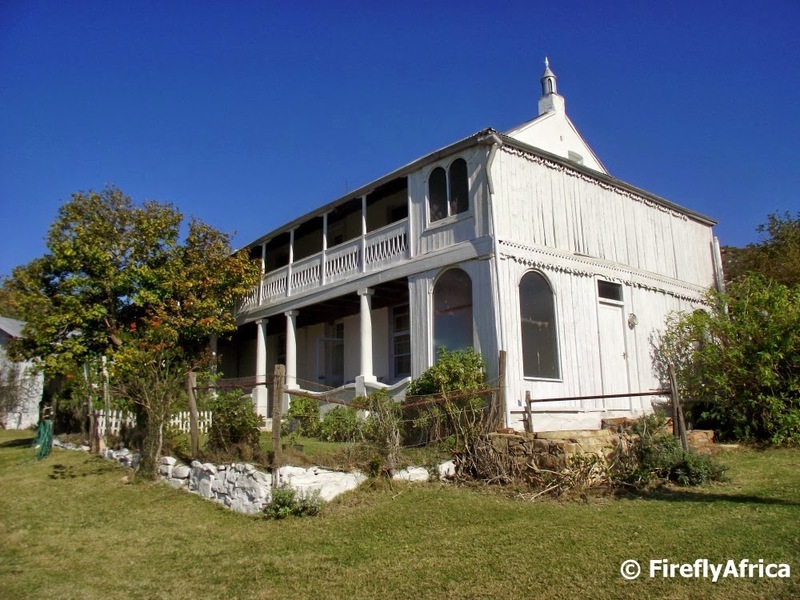 Amongst that is the fact that the town was protected by 6 British Forts during the Anglo Boer War. 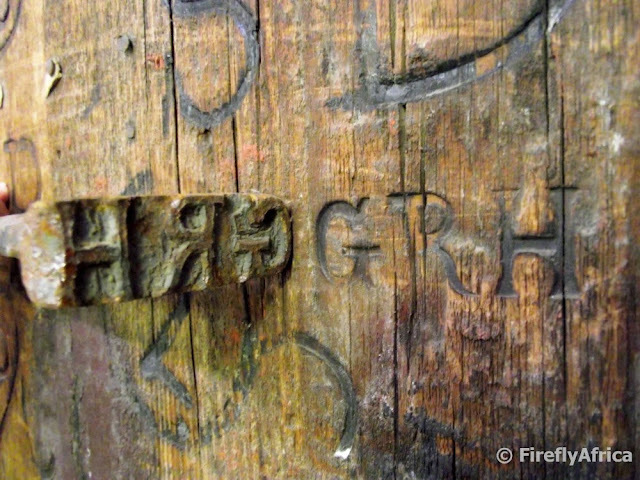 One of these have been restored and can be visited on a hill overlooking the town. I've always looked up at it passing through but on my last visit I decided to go and look for the Geocache located at the fort and made my way up for a closer look. 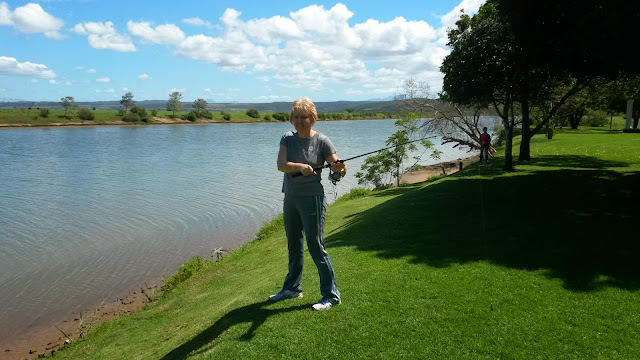 Returning from Gauteng on a recent road trip I decided to make a little detour via the Gariep Dam and ﻿take the Steynsburg and Hofmeyr road through the Karoo to Cradock. I made a lunch and leg stretch stop at the lookout overlooking the Gariep Dam wall. 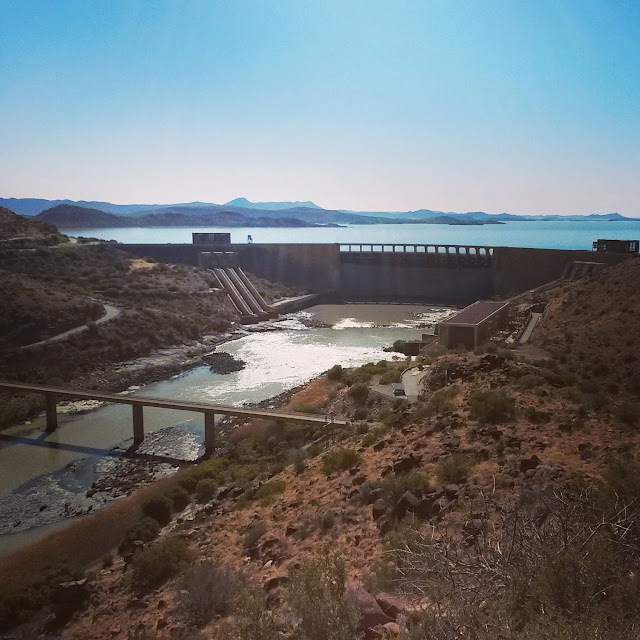 The Gariep Dam was opened in 1071 and initially called the Hendrik Verwoerd Dam after the first prime minister of the Republic of South Africa. After the end of Apartheid it was decided to change the name to the Gariep Dam. 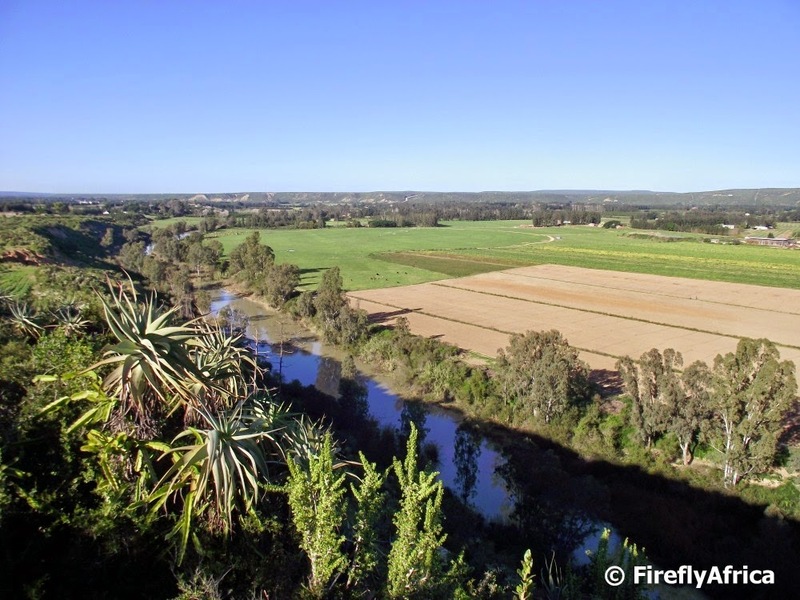 Gariep is the original name of the Orange River and means "river" in the Khoekhoe (Khoisan) language. The Gariep Dam is the biggest dam in South Africa and has a total storage capacity of approximately 5,340,000 megalitres and a surface area of more than 370 square kilometers when full. The wall is 88 meters high and along its crest is 914 meters long. Truly a South African man made marvel. On Saturday we headed into the Gamtoos Valley for the annual Gamtoos Tourism Adventure Drive. 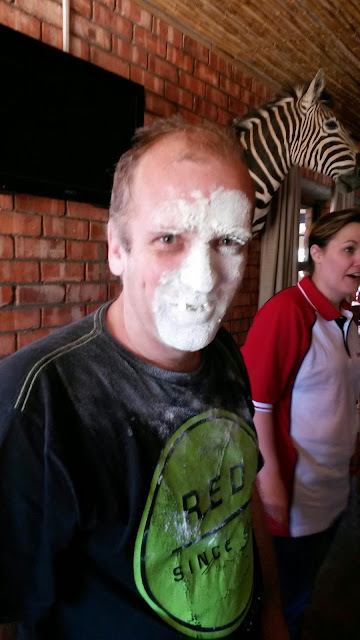 This year the event took place around the towns of Loerie and Hankey and it was a heck of a lot of fun, to say the least. The Adventure Drive takes the form of a 60km round trip which gets completed by following directions given at the start of the race. Along the way there are 9 stops with challenges that need to be completed. At each challenge you get points awarded and along with the times a calculation is made to determine the winner of the day. 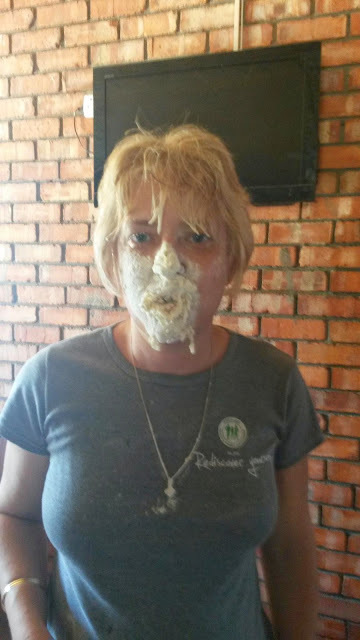 This year the event started and ended at Loerie Ruskamp between Loerie and Hankey and it turned out to be a great base with breakfast served before we got going and a lekker braai lunch while we waited for the prize giving. 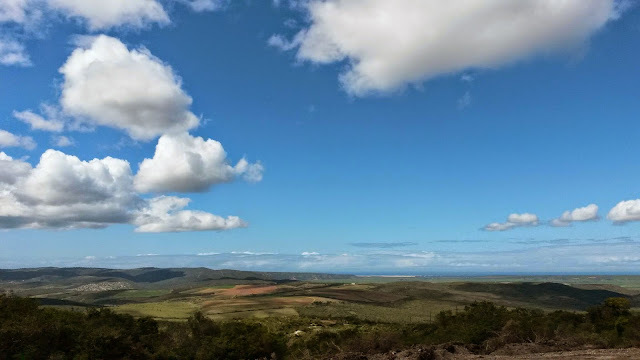 At one of the stops we had this magnificent view (see pic above) over the valley down towards the coastline while other stops included InnieKloof, Milk House, Hankey Golf Club, Sarah Baartman's grave site, The Gamtoos Ferry Hotel, Spekboom Lapa, Loerie Dam and the Koekepan Padstal. I didn't take the camera along this year but my trusty new Samsung S4 mini did come in handy to snap a couple of pics along the way. 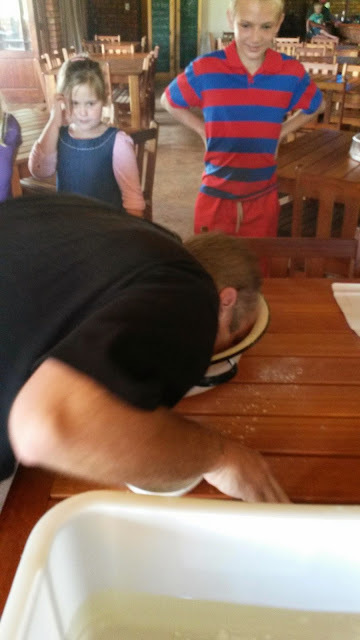 Retrieving smarties from a bowl of flour after first getting the small bowl out a bath full of water... all with my mouth. The guys at Spekboom Lapa was evil giving us this to do. 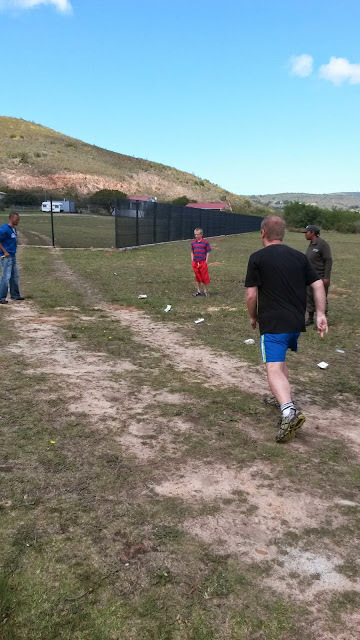 Another unusual sport we got to do was Jukskei. You throw objects that look like wooden cake rollers and see if you can hit the stick on the other side. It looks very easy but it is slightly more tricky than we thought. Another first for the Damselfly was casting with a fishing rod into the Gamtoos River. At least she reached the river and didn't ricochet back into the tree like one of our friends did. 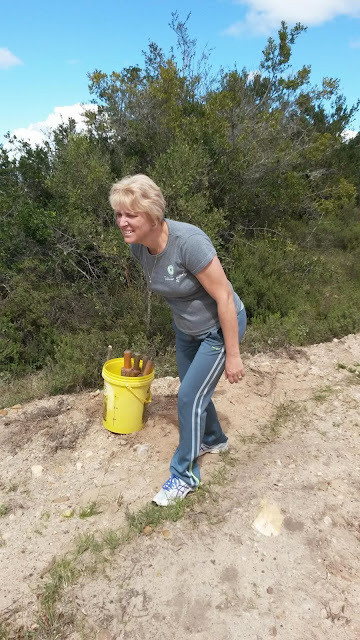 Some of the other activities included shooting with a kettie, throwing naartjies into bins for points and running around a garden picking oranges, lemons and grapefruit. This was the third year we took part in the race and we will definitively be back again next year. Its a hot day in the southern Karoo just north of the Zuurberg in the Eastern Cape. Not a breath of air moving. Cicadas are chirping away in the surrounding veld. Its been four days since you left the small port town of Port Elizabeth and after struggling up the rough Zuurberg Pass the previous day and camping out near the Zuurberg Inn, the day is spent making your way down the pass and into the dry and flat area beyond. The oxen are acting up after the hard trek and the family on the back of the wagon is tired. You shout to the man leading the front ox to keep it tight and strike your whip to make sure the rest of the animals follow like they should. Sweat trickles down into your one eye and you lift your hat to wipe your brow. Coming round a corner you look back to make sure the young boy working the brake behind the wagon is alert. Then you spot it. The welcome sight of the next inn on the route north. Ann's Villa at the bottom of the pass. Somewhere to outspan and let the people and oxen rest, have some repairs done and stock up on food. The date is (or was) 1874. Now its 2014, 140 years later and I'm spending a Sho't Left weekend at Ann's Villa with the family, taking in the open spaces, history and beautiful surroundings. The Inn looks the same but there are no ox wagons in sight though. Ann's Villa was opened in 1864 - making it 150 years old in 2014 - by John Webster, only 6 years after the official opening of the Zuurberg Pass in 1858. 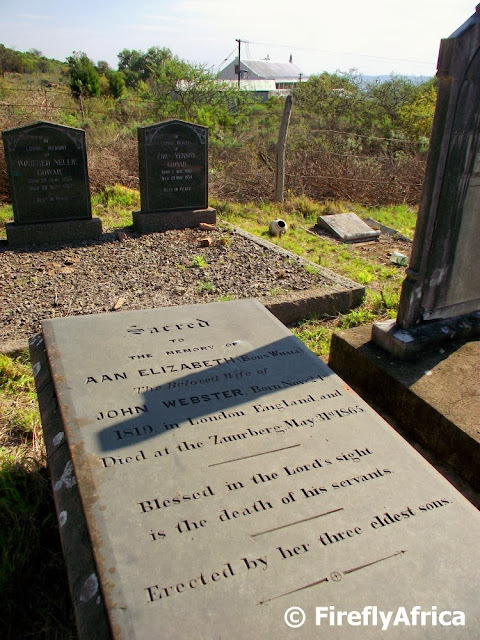 Webster was a baker by trade and sailed for Algoa Bay from Scotland with his family in 1849. They lived in Port Elizabeth for 5 years before Webster sold his bakery and bought the farm “Kleinplaas” (now Ann’s Villa) from a Mr Grobbelaar. The family appear to have lived in the old cottage on the property (Bergview Terrace, later renamed Verbena Cottage) and Webster baked for the road builders who were 10 km away at Stebbings Convict Station. After the pass was opened he built Ann’s Villa in its current form. The villa was named after his wife Ann Elizabeth Whall who died a year after it was opened. She was 46 at the time and had borne 14 children in her lifetime. A year after Ann’s death, John Webster married again. This time to Mary Ann Jenkins (he seemed to love women named Ann). In 1867 diamonds were discovered and the diamond rush began. With its seven rooms the villa boomed. 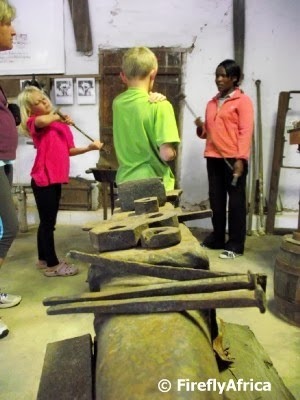 It’s base at the foot of the Zuurberg Pass was perfect for the blacksmith, wheelwright, bakery and shop. (the latter is still in the villa and virtually unchanged). In 1896 a post office and a school were added. The corrugated iron shed with its sprung floor was ordered from England as a kit and used both as a shearing shed and for local dances while Ann’s Villa also became a centre for sport like tennis and shooting. 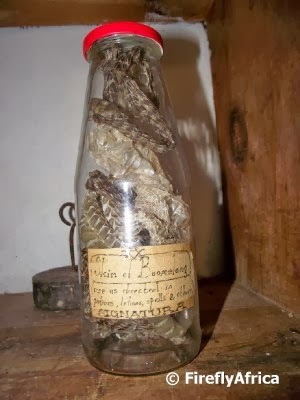 After mentioning Ann's Villa in a blog post some time ago, I got an email from the owner, Jeremy Lunn, to bring the family for a weekend and experience this piece of history first hand. These days Ann's Villa offers self catering accommodation in those same seven rooms that the early travelers would have stayed in. The house also has a fully kitted out kitchen for visitors to prepare their meals in or you can have a braai on the back verandah. We made full use of the lounge and games room on both evenings we were there as well and the KidZ would have played games all night long if they could (or had the energy). Our whole idea behind the weekend was to go somewhere away from everything to unwind and Ann's Villa was perfect for it. There isn't much traffic on the pass so we could sit out in the front garden the whole afternoon relaxing with a couple of books while the KidZ played on the lawn. Walks were also high on our "to do" list and we explore both down the road as well as up the pass. The first afternoon I moseyed over to the old grave yard next to the house and found the graves of the Websters. In the case of the one in the picture, Ann (check how it was spelled on her grave stone) Elizabeth Webster after whom Ann's Villa was named. The history attached to Ann's Villa is amazing and more so the fact that it has been maintained for all these years. Attached to Ann's Villa is the old General Dealer where travelers would stock up their supplies and locals would have come to shop at. During the Anglo Boer War wounded British soldiers stayed at Ann's Villa and Boer commandoes even raided this same store. Walking through the old shop there is something interesting to see on every shelf. 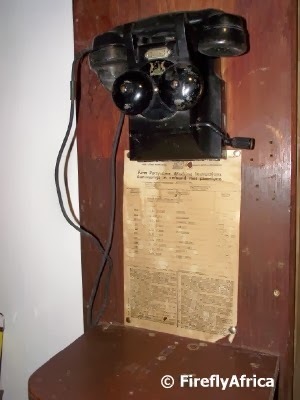 The General Dealer also had a post office and that and the old public telephone can still be seen. Even though we had cold drinks in the kitchen the KidZ wanted to buy drinks from the shop just to be able to say that they did. Another interesting part of Ann's Villa is the Blacksmith Museum. 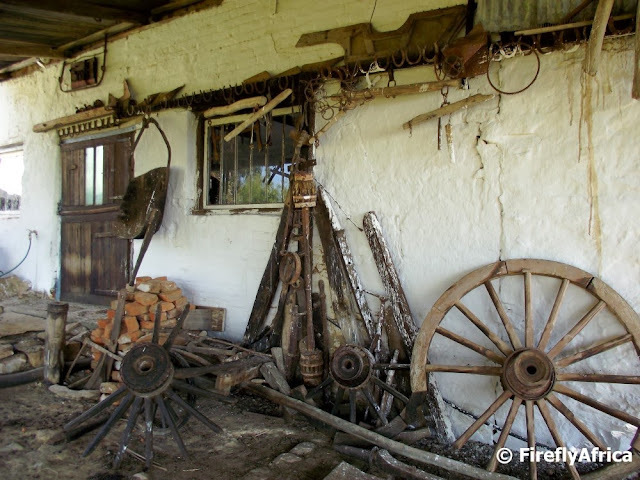 Due to the very bad road across the Zuurberg Mountains a lot of the wagons were damaged and in need of repairs by the time they got to Ann's Villa hence the blacksmith and wheelwright being added to the inn, bakery and shop back then. The museum contains all the original equipment that was found in the blacksmith's workshop and more with some of it actually dating back to the early days at Ann's Villa. 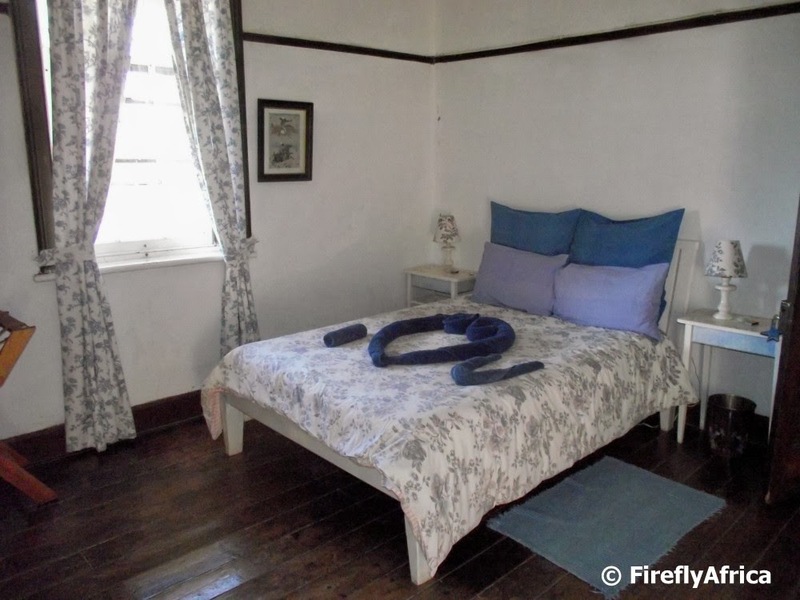 Guided tours of the Blacksmith Museum is available not just for those staying over at Ann's Villa but also for the public and the guide would even demonstrate some of the equipment in the museum. At first the KidZ weren't to keen on the tour thinking it was going to be boring but by the end we couldn't get them away. They wanted to see everything and know what every piece was and the "boring museum", as Chaos Boy put it before we went on the tour, suddenly became very interesting indeed. The first time we stopped at Ann's Villa briefly I asked the lady who showed us around if it was haunted and she said no without blinking. This time around I was a little worried about the KidZ though before we went as I didn't want to sit with two children thinking there were ghosts in this old building. Well, two days later and no ghosts, no hauntings and no scared children. With us being the only ones staying over this weekend they did give it horns a bit so perhaps the ghosts were the scared ones hiding away. Hie-hie-hie. While on the tour of the Blacksmith Museum they did hear footsteps on the roof, but on closer investigation it turned out to be a family of dassies that lived in the attic. One unusual thing though. As you come in the front door of Ann's Villa there is a door to a room under the stairs. On the door it says, "PRIVATE. 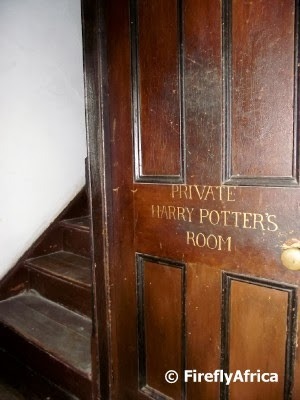 HARRY POTTER'S ROOM". Even more peculiar and on the same topic is the magic potion ingredients available in the shop. Did Harry Potter really visit here and what is the magic connection? These magic muggles are curious. Disclaimer: We spent the weekend at Ann's Villa as guests but all other expenses and transport were covered by ourselves. I received no further remuneration, wasn't asked to write a positive post and keep full editorial control. 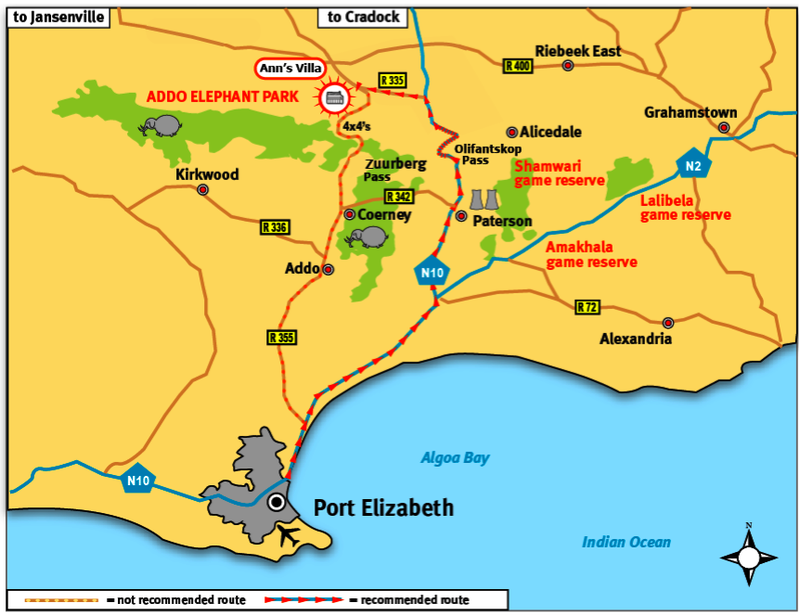 Directions: Ann's Villa is situated just over an hour from Port Elizabeth. Follow the N10 via Paterson and thr Olifantskops Pass and turn left on the R335 dirt road north of the pass. The Tsitsikamma is a world of indigenous forests bordered by mountains and a rugged coastline. One of the most beautiful places there is. At the heart of it lies the Tsitsikamma National Park. The Mouth Trail takes visitors from the park's restaurant area to the Storms River Mouth with its three suspension bridges. Just after you start off on the trail there is a little waterfall on the left hand side flowing into a pool. A tranquil spot even with tourists walking past every few seconds.